Can anyone think of a LOLcats caption? In this episode of BOYT, Norman Cook is bottled by Iggy Pop, 'Big Daddy' is running a Back Porch business and, for a spot of comic relief, the cat plays the piano. Aren't cats funny? Well, if you're getting as irritated by the internet phenomenon LOLcats as I am then actually, no, they're not. 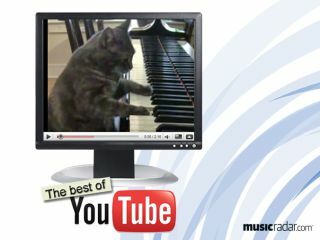 However, pry a little further into the internet-cat world - past stupid pictures of illbred pets propped up by ill-conceived captions - and you'll find felines of genuine intrigue, such as Nora the piano-playing cat. Behold the self-procliamed Elbow Drummer. It kicks off at 2:20 - given his arm action, you may have your own theories as to how he got such a strong right bicep.